Next week, I will have the opportunity to be the mom who brings a story and snack to the preschool class! I asked my son, Alex, what book I should bring to share with his friends. He thought about it and then suggested, "What about the book about the dinosaur who bakes cookies?" 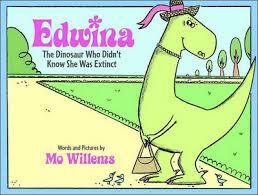 Alex was referring to Mo Willems' Edwina: The Dinosaur Who Didn't Know She Was Extinct. If you don't know this story, it is about a boy who knows everything about everything, Reginald Von Hoobie Doobie and a popular, beloved dinosaur named Edwina. Reginald could not understand why the townspeople loved Edwina, who was clearly extinct. No one would listen to him....except Edwina who ends up being a listener who lets Reginald have his say. But is she convinced she is extinct? To find out what happens to Reginald and Edwina, you have to read the book! So, Alex's book choice was set. I'm also reading to Megan's nursery school class since it will be her birthday. 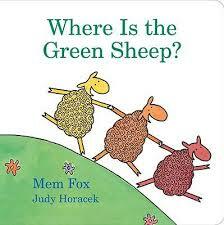 For her 2 and 3 year old friends, I'll be reading Mem Fox's Where Is the Green Sheep? Her teacher requested a St.Patrick's Day book, but to be honest, I have never found a great St. Patrick's Day book that would hold the attention of such young children. The Green Sheep never disappoints and I think it works for the theme since it has GREEN in the title! This got me thinking about our local library's initiative to have children read one thousand books before kindergarten. I enrolled both Alex and Megan in the program, but I have stopped recording each book we read. It would have been cool to have a list of every book, but in our hustle and bustle days, this just did not seem possible. Still, Alex and Megan have been surrounded by Goodnight Moon, The Very Hungry Caterpillar, I Love You Stinkyface, That is Not a Good Idea, The Cat in the Hat, Alexander and the Wind-Up Mouse, Little Mouse, the Red Ripe Strawberry and the Big Hungry Bear, Good Night Good Night Construction Site, just to name a few. With all the money that has been poured into the testing industry and teacher evaluation programs that are designed to give a teacher a label (flying in the face of growth mindset, but guess that's a post for another day), how I wish the funds might have been spent getting books into the hands of children and an adult who could read to them. If our kids came to school with a rich literacy background, simply from being read to often, would we be in a better place than changing nothing in a child's life but then testing the daylights out of them at age 8? Which way would enrich a child's life? (Though I can't break the super secrecy of the NYS ELA exams, I can assert that I did not find them enriching in the least). I am really interested in the idea of Little Free Libraries and exploring the idea of bringing them to the community where I work. If a Little Free Library was placed near a laundromat, would that change the experience for kids stuck inside there for a period of time? If it was placed near a bus stop, how might that help a parent and child pass the time differently? If books were more accessible, could that change a child's school experience? Before I had my children, I was on a committee through the Nassau Reading Council to provide books for babies. The group met with teen mothers and explained the importance of reading to children and then provided them with books. 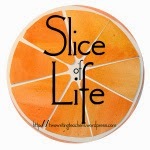 I'd love to get involved with that type of group again or figure out other ways to help get the word out that the more you read to a small child, the better you are preparing that child for school success as well as building a curious, empathetic, kind child. Edwina: The Dinosaur Who Didn't Know She Was Extinct and Where is the Green Sheep are both fantastic stories filled with rich language. My children are better for knowing these stories. Shouldn't all kids get that chance?